Lv, S. ; Dudek, D. M. ; Cao, Y. ; Balamurali, M. M. ; Gosline, J. ; Li, H. Designed Biomaterials To Mimic The Mechanical Properties Of Muscles. Nature (London, United Kingdom) 2010, 465, 69 - 73. He, C. ; Genchev, G. Z. ; Lu, H. ; Li, H. Mechanically Untying A Protein Slipknot: Multiple Pathways Revealed By Force Spectroscopy And Steered Molecular Dynamics Simulations. JOURNAL OF THE AMERICAN CHEMICAL SOCIETY 2012, 134, 10428-10435. Zheng, P. ; Takayama, S. -ichiJ. ; A. Mauk, G. ; Li, H. Hydrogen Bond Strength Modulates The Mechanical Strength Of Ferric-Thiolate Bonds In Rubredoxin. JOURNAL OF THE AMERICAN CHEMICAL SOCIETY 2012, 134, 4124-4131. Our research program is in the area of single molecule biophysical chemistry. We are interested in the mechanical properties and conformational dynamics of elastic proteins. Elastic proteins are important structural and functional components in living cells. They serve as molecular springs in tissues to establish elastic connections and provide mechanical strength, elasticity, and extensibility. They are not only important for their biological functions in various biological processes, but also important building blocks for bottom-up construction of smart materials and mechanical devices on the nanoscale. Our main research tool is single molecule atomic force microscopy. The AFM is a powerful technique allowing us to directly manipulate proteins one molecule at a time. We use the AFM to measure the mechanical properties of proteins, and monitor the folding/unfolding trajectories of single protein in real time. Our long term goal is to understand the mechanical properties of proteins at the single molecule level and use protein engineering techniques to design proteins with tailored mechanical properties to be used as functional and structural components for smart materials and nanomechanical devices. 1. Protein Mechanics and Engineering: combining protein engineering with single molecule AFM and computation, we rationally design and engineer proteins with tailored mechanical properties. J. Am. Chem. Soc. 2012, 134, 4124-4131. Acc. Chem. Res. 2010, 43, 1331-1341. J. Am. Chem. Soc. 2009, 131,14050-14056. Proc. Nat. Acad. Sci. USA, 2008, 105, 11152-11157. Nature Nanotechnology, 2008, 3, 512-516. 2. Single Protein Folding/Unfolding Dynamics: we use single molecule force spectroscopy techniques to investigate the folding/unfolding dynamics and mechanism of proteins at the single molecule level. Proc. Nat. Acad. Sci. USA, 2013, 110, 18156-18161. J. Am. Chem. Soc. 2013, 135, 7992-8000. BIOPHYSICAL JOURNAL 2012, 103, 807-816. J. Am. Chem. Soc. 2012, 134, 10428-10435. J. Am. Chem. Soc. 2009, 131, 13347-13354. Proc. Nat. Acad. Sci. USA, 2008, 105, 1885-1890. 3. Protein-based Biomaterials: using the knowledge from protein mechanics studies, we rationally design protein-based biomaterials with tailored mechanical properties for various biomedical applications. We rationally tailor macroscopic mechanical properties of these biomaterials by programming the molecular sequence, and thus nanomechanical properties, of protein building blocks at the single-molecule level. Nature 2010, 465, 69 – 73. Acta Biomaterialia 2013, 9, 6481-6491. 4. Polymer physical chemistry using single molecule AFM: we use single molecule AFM to investigate the conformational change of polymers at the singel molecule level. Li, J. ; Li, H. Mechanical Unfolding Pathway Of The High-Potential Iron-Sulfur Protein Revealed By Single-Molecule Atomic Force Microscopy: Toward A General Unfolding Mechanism For Iron-Sulfur Proteins. JOURNAL OF PHYSICAL CHEMISTRY B 2018, 122, 9340-9349. Nassar, R. ; Wong, E. ; Bui, J. M. ; Yip, C. K. ; Li, H. ; Gsponer, J. ; Lamour, G. Mechanical Anisotropy In Gnnqqny Amyloid Crystals. JOURNAL OF PHYSICAL CHEMISTRY LETTERS 2018, 9, 4901-4909. Li, H. ; Zheng, P. Single Molecule Force Spectroscopy: A New Tool For Bioinorganic Chemistry. CURRENT OPINION IN CHEMICAL BIOLOGY 2018, 43, 58-67. Hu, C. ; Su, C. ; Yun, Z. ; Wang, S. ; He, C. ; Gao, X. ; Li, S. ; Li, H. ; Hu, X. ; Hu, X. Real-Time Identification Of The Singleness Of A Trapped Bead In Optical Tweezers. APPLIED OPTICS 2018, 57, 1241-1246. Kong, N. ; Fu, L. ; Peng, Q. ; Li, H. Metal Chelation Dynamically Regulates The Mechanical Properties Of Engineered Protein Hydrogels. ACS BIOMATERIALS SCIENCE & ENGINEERING 2017, 3, 742-749. Lamour, G. ; Nassar, R. ; Chan, P. H. W. ; Bozkurt, G. ; Li, J. ; Bui, J. M. ; Yip, C. K. ; Mayor, T. ; Li, H. ; Wu, H. ; Gsponer, J. A. Mapping The Broad Structural And Mechanical Properties Of Amyloid Fibrils. BIOPHYSICAL JOURNAL 2017, 112, 584-594. Lei, H. ; Guo, Y. ; Hu, X. ; Hu, C. ; Hu, X. ; Li, H. Reversible Unfolding And Folding Of The Metalloprotein Ferredoxin Revealed By Single-Molecule Atomic Force Microscopy. JOURNAL OF THE AMERICAN CHEMICAL SOCIETY 2017, 139, 1538-1544. He, C. ; Li, H. Staphylokinase Displays Surprisingly Low Mechanical Stability. LANGMUIR 2017, 33, 1077-1083. Li, H. ; Walker, G. C. Twist And Shout: Single-Molecule Mechanochemistry. ACS NANO 2017, 11, 28-30. Gao, X. ; Fang, J. ; Xue, B. ; Fu, L. ; Li, H. Engineering Protein Hydrogels Using Spycatcher-Spytag Chemistry. BIOMACROMOLECULES 2016, 17, 2812-2819. Li, H. ; Kong, N. ; Laver, B. ; Liu, J. Hydrogels Constructed From Engineered Proteins. SMALL 2016, 12, 973-987. Feng, J. ; Lamour, G. ; Xue, R. ; Mirvakliki, M. Negar; Hatzikiriakos, S. G. ; Xu, J. ; Li, H. ; Wang, S. ; Lu, X. Chemical, Physical And Morphological Properties Of Bacterial Biofilms Affect Survival Of Encased Campylobacter Jejuni F38011 Under Aerobic Stress. INTERNATIONAL JOURNAL OF FOOD MICROBIOLOGY 2016, 238, 172-182. Si, C. ; Li, J. ; Luo, Q. ; Hou, C. ; Pan, T. ; Li, H. ; Liu, J. An Ion Signal Responsive Dynamic Protein Nano-Spring Constructed By High Ordered Host-Guest Recognition. CHEMICAL COMMUNICATIONS 2016, 52, 2924-2927. Kong, N. ; Li, H. Protein Fragment Reconstitution As A Driving Force For Self-Assembling Reversible Protein Hydrogels. ADVANCED FUNCTIONAL MATERIALS 2015, 25, 5593-5601. Panwar, P. ; Lamour, G. ; Mackenzie, N. C. W. ; Yang, H. ; Ko, F. ; Li, H. ; Broemme, D. Changes In Structural-Mechanical Properties And Degradability Of Collagen During Aging-Associated Modifications. JOURNAL OF BIOLOGICAL CHEMISTRY 2015, 290, 23291-23306. He, C. ; Hu, C. ; Hu, X. ; Hu, X. ; Xiao, A. ; Perkins, T. T. ; Li, H. Direct Observation Of The Reversible Two-State Unfolding And Refolding Of An Alpha/beta Protein By Single-Molecule Atomic Force Microscopy. ANGEWANDTE CHEMIE-INTERNATIONAL EDITION 2015, 54, 9921-9925. Zheng, P. ; Arantes, G. M. ; Field, M. J. ; Li, H. Force-Induced Chemical Reactions On The Metal Centre In A Single Metalloprotein Molecule. NATURE COMMUNICATIONS 2015, 6, 7569. Hu, C. ; An, R. ; Zhang, C. ; Lei, H. ; Hu, X. ; Li, H. ; Hu, X. Design Of A High-Quality Optical Conjugate Structure In Optical Tweezers. APPLIED OPTICS 2015, 54, 1410-1413. Lei, H. ; Hu, X. ; Zhu, P. ; Chang, X. ; Zeng, Y. ; Hu, C. ; Li, H. ; Hu, X. Nano-Level Position Resolution For Particle Tracking In Digital In-Line Holographic Microscopy. Journal of Microscopy 2015, 260, 106. Zheng, P. ; Wang, Y. ; Li, H. Reversible Unfolding-Refolding Of Rubredoxin: A Single-Molecule Force Spectroscopy Study. ANGEWANDTE CHEMIE-INTERNATIONAL EDITION 2014, 53, 14060-14063. Kong, N. ; Peng, Q. ; Li, H. Rationally Designed Dynamic Protein Hydrogels With Reversibly Tunable Mechanical Properties. ADVANCED FUNCTIONAL MATERIALS 2014, 24, 7310-7317. Kovacic, S. ; Samii, L. ; Lamour, G. ; Li, H. ; Linke, H. ; Bromley, E. H. C. ; Woolfson, D. N. ; Curmi, P. M. G. ; Forde, N. R. Construction And Characterization Of Kilobasepair Densely Labeled Peptide-Dna. BIOMACROMOLECULES 2014, 15, 4065-4072. Hu, X. ; Li, H. Force Spectroscopy Studies On Protein-Ligand Interactions: A Single Protein Mechanics Perspective. FEBS LETTERS 2014, 588, 3613-3620. He, C. ; Lamour, G. ; Xiao, A. ; Gsponer, J. ; Li, H. Mechanically Tightening A Protein Slipknot Into A Trefoil Knot. JOURNAL OF THE AMERICAN CHEMICAL SOCIETY 2014, 136, 11946-11955. Xue, Y. ; Li, X. ; Li, H. ; Zhang, W. Quantifying Thiol-Gold Interactions Towards The Efficient Strength Control. NATURE COMMUNICATIONS 2014, 5, 4348. Bull, M. S. ; Sullan, R. May A. ; Li, H. ; Perkins, T. T. Improved Single Molecule Force Spectroscopy Using Micromachined Cantilevers. ACS NANO 2014, 8, 4984-4995. Lamour, G. ; Yip, C. K. ; Li, H. ; Gsponer, J. High Intrinsic Mechanical Flexibility Of Mouse Prion Nanofibrils Revealed By Measurements Of Axial And Radial Young's Moduli. ACS NANO 2014, 8, 3851-3861. Wang, Y. ; Hu, X. ; Bu, T. ; Hu, C. ; Hu, X. ; Li, H. Molecular Calipers For Highly Precise And Accurate Measurements Of Single-Protein Mechanics. LANGMUIR 2014, 30, 2761-2767. Bai, Y. ; Luo, Q. ; Zhang, W. ; Miao, L. ; Xu, J. ; Li, H. ; Liu, J. Highly Ordered Protein Nanorings Designed By Accurate Control Of Glutathione S-Transferase Self-Assembly. JOURNAL OF THE AMERICAN CHEMICAL SOCIETY 2013, 135, 10966-10969. Zheng, P. ; Takayama, S. -ichiJ. ; A. Mauk, G. ; Li, H. Single Molecule Force Spectroscopy Reveals That Iron Is Released From The Active Site Of Rubredoxin By A Stochastic Mechanism. JOURNAL OF THE AMERICAN CHEMICAL SOCIETY 2013, 135, 7992-8000. Lv, S. ; Bu, T. ; Kayser, J. ; Bausch, A. ; Li, H. Towards Constructing Extracellular Matrix-Mimetic Hydrogels: An Elastic Hydrogel Constructed From Tandem Modular Proteins Containing Tenascin Fniii Domains. ACTA BIOMATERIALIA 2013, 9, 6481-6491. Panwar, P. ; Du, X. ; Sharma, V. ; Lamour, G. ; Castro, M. ; Li, H. ; Broemme, D. Effects Of Cysteine Proteases On The Structural And Mechanical Properties Of Collagen Fibers. JOURNAL OF BIOLOGICAL CHEMISTRY 2013, 288, 5940-5950. Fang, J. ; Mehlich, A. ; Koga, N. ; Huang, J. ; Koga, R. ; Gao, X. ; Hu, C. ; Jin, C. ; Rief, M. ; Kast, J. ; Baker, D. ; Li, H. Forced Protein Unfolding Leads To Highly Elastic And Tough Protein Hydrogels. Nature Communications 2013, 4. Zoldak, G. ; Stigler, J. ; Pelz, B. ; Li, H. ; Rief, M. Ultrafast Folding Kinetics And Cooperativity Of Villin Headpiece In Single-Molecule Force Spectroscopy. PROCEEDINGS OF THE NATIONAL ACADEMY OF SCIENCES OF THE UNITED STATES OF AMERICA 2013, 110, 18156-18161. Ostapchenko, V. G. ; Beraldo, F. H. ; Mohammad, A. H. ; Xie, Y. - F. ; Hirata, P. H. F. ; Magalhaes, A. C. ; Lamour, G. ; Li, H. ; Maciejewski, A. ; Belrose, J. C. ; Teixeira, B. L. ; Fahnestock, M. ; Ferreira, S. T. ; Cashman, N. R. ; Hajj, G. N. M. ; Jackson, M. F. ; Choy, W. - Y. ; MacDonald, J. F. ; Martins, V. R. ; Prado, V. F. ; Prado, M. A. M. The Prion Protein Ligand, Stress-Inducible Phosphoprotein 1, Regulates Amyloid-Beta Oligomer Toxicity. JOURNAL OF NEUROSCIENCE 2013, 33, 16552-16564. Li, Y. Devin; Lamour, G. ; Gsponer, J. ; Zheng, P. ; Li, H. The Molecular Mechanism Underlying Mechanical Anisotropy Of The Protein Gb1. BIOPHYSICAL JOURNAL 2012, 103, 2361-2368. Shen, T. ; Cao, Y. ; Zhuang, S. ; Li, H. Engineered Bi-Histidine Metal Chelation Sites Map The Structure Of The Mechanical Unfolding Transition State Of An Elastomeric Protein Domain Gb1. BIOPHYSICAL JOURNAL 2012, 103, 807-816. Bu, T. ; Wang, H. - C. Eileen; Li, H. Single Molecule Force Spectroscopy Reveals Critical Roles Of Hydrophobic Core Packing In Determining The Mechanical Stability Of Protein Gb1. LANGMUIR 2012, 28, 12319-12325. Peng, Q. ; Kong, N. ; Wang, H. - C. Eileen; Li, H. Designing Redox Potential-Controlled Protein Switches Based On Mutually Exclusive Proteins. PROTEIN SCIENCE 2012, 21, 1222-1230. Fang, J. ; Li, H. A Facile Way To Tune Mechanical Properties Of Artificial Elastomeric Proteins-Based Hydrogels. LANGMUIR 2012, 28, 8260-8265. Lv, S. ; Cao, Y. ; Li, H. Tandem Modular Protein-Based Hydrogels Constructed Using A Novel Two-Component Approach. LANGMUIR 2012, 28, 2269-2274. Zheng, P. ; Li, H. Highly Covalent Ferric-Thiolate Bonds Exhibit Surprisingly Low Mechanical Stability. JOURNAL OF THE AMERICAN CHEMICAL SOCIETY 2011, 133, 6791-6798. Cao, Y. ; Li, Y. Devin; Li, H. Enhancing The Mechanical Stability Of Proteins Through A Cocktail Approach. BIOPHYSICAL JOURNAL 2011, 100, 1794-1799. Zheng, P. ; Cao, Y. ; Bu, T. ; Straus, S. K. ; Li, H. Single Molecule Force Spectroscopy Reveals That Electrostatic Interactions Affect The Mechanical Stability Of Proteins. BIOPHYSICAL JOURNAL 2011, 100, 1534-1541. Cao, Y. ; Li, H. Single-Molecule Force-Clamp Spectroscopy: Dwell Time Analysis And Practical Considerations. LANGMUIR 2011, 27, 1440-1447. Aioanei, D. ; Lv, S. ; Tessari, I. ; Rampioni, A. ; Bubacco, L. ; Li, H. ; Samori, B. ; Brucale, M. Single-Molecule-Level Evidence For The Osmophobic Effect. ANGEWANDTE CHEMIE-INTERNATIONAL EDITION 2011, 50, 4394-4397. 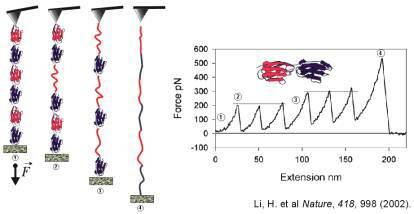 Cao, Y. ; Li, H. Dynamics Of Protein Folding And Cofactor Binding Monitored By Single-Molecule Force Spectroscopy. BIOPHYSICAL JOURNAL 2011, 101, 2009-2017. Peng, Q. ; Fang, J. ; Wang, M. ; Li, H. Kinetic Partitioning Mechanism Governs The Folding Of The Third Fniii Domain Of Tenascin-C: Evidence At The Single-Molecule Level. JOURNAL OF MOLECULAR BIOLOGY 2011, 412, 698-709. Zheng, P. ; Li, H. Direct Measurements Of The Mechanical Stability Of Zinc-Thiolate Bonds In Rubredoxin By Single-Molecule Atomic Force Microscopy. BIOPHYSICAL JOURNAL 2011, 101, 1467-1473. Zheng, P. ; Cao, Y. ; Li, H. Facile Method Of Constructing Polyproteins For Single-Molecule Force Spectroscopy Studies. LANGMUIR 2011, 27, 5713-5718. Li, H. ; Cao, Y. Protein Mechanics: From Single Molecules To Functional Biomaterials. ACCOUNTS OF CHEMICAL RESEARCH 2010, 43, 1331-1341. Jollymore, A. ; Li, H. Measuring ``unmeasurable'' Folding Kinetics Of Proteins By Single-Molecule Force Spectroscopy. JOURNAL OF MOLECULAR BIOLOGY 2010, 402, 610-617. Liu, N. ; Peng, B. ; Lin, Y. ; Su, Z. ; Niu, Z. ; Wang, Q. ; Zhang, W. ; Li, H. ; Shen, J. Pulling Genetic Rna Out Of Tobacco Mosaic Virus Using Single-Molecule Force Spectroscopy. JOURNAL OF THE AMERICAN CHEMICAL SOCIETY 2010, 132, 11036-11038. Liu, N. ; Bu, T. ; Song, Y. ; Zhang, W. ; Li, J. ; Zhang, W. ; Shen, J. ; Li, H. The Nature Of The Force-Induced Conformation Transition Of Dsdna Studied By Using Single Molecule Force Spectroscopy. LANGMUIR 2010, 26, 9491-9496. Zhuang, S. ; Linhananta, A. ; Li, H. Phenotypic Effects Of Ehlers-Danlos Syndrome-Associated Mutation On The Fniii Domain Of Tenascin-X. Protein Science 2010, 19, 2231 - 2239. Zhuang, S. L. ; Peng, Q. ; Cao, Y. ; Li, H. B. Modulating The Mechanical Stability Of Extracellular Matrix Protein Tenascin-C In A Controlled And Reversible Fashion. Journal of Molecular Biology 2009, 390, 820-829. Jollymore, A. ; Lethias, C. ; Peng, Q. ; Cao, Y. ; Li, H. B. Nanomechanical Properties Of Tenascin-X Revealed By Single-Molecule Force Spectroscopy. Journal of Molecular Biology 2009, 385, 1277-1286. Peng, Q. ; Li, H. Domain Insertion Effectively Regulates The Mechanical Unfolding Hierarchy Of Elastomeric Proteins: Toward Engineering Multifunctional Elastomeric Proteins. JOURNAL OF THE AMERICAN CHEMICAL SOCIETY 2009, 131, 14050-14056. Peng, Q. ; Li, H. Direct Observation Of Tug-Of-War During The Folding Of A Mutually Exclusive Protein. JOURNAL OF THE AMERICAN CHEMICAL SOCIETY 2009, 131, 13347-13354. Cao, Y. ; Er, K. Shih; Parhar, R. ; Li, H. A Force-Spectroscopy-Based Single-Molecule Metal-Binding Assay. CHEMPHYSCHEM 2009, 10, 1450-1454. Cao, Y. ; Li, H. B. Engineering Tandem Modular Protein Based Reversible Hydrogels. Chemical Communications 2008, 4144-4146. Li, H. B. ’Mechanical Engineering’ Of Elastomeric Proteins: Toward Designing New Protein Building Blocks For Biomaterials. Advanced Functional Materials 2008, 18, 2643-2657. Balamurali, M. M. ; Sharma, D. ; Chang, A. ; Khor, D. ; Chu, R. ; Li, H. B. Recombination Of Protein Fragments: A Promising Approach Toward Engineering Proteins With Novel Nanomechanical Properties. Protein Science 2008, 17, 1815-1826. Sharma, D. ; Feng, G. ; Khor, D. ; Genchev, G. Z. ; Lu, H. ; Li, H. B. Stabilization Provided By Neighboring Strands Is Critical For The Mechanical Stability Of Proteins. Biophysical Journal 2008, 95, 3935-3942. Cao, Y. ; Li, H. How Do Chemical Denaturants Affect The Mechanical Folding And Unfolding Of Proteins?. Journal of Molecular Biology 2008, 375, 316-324. Peng, Q. ; Li, H. B. Atomic Force Microscopy Reveals Parallel Mechanical Unfolding Pathways Of T4 Lysozyme: Evidence For A Kinetic Partitioning Mechanism. Proceedings of the National Academy of Sciences of the United States of America 2008, 105, 1885-1890. Cao, Y. ; Balamurali, M. M. ; Sharma, D. ; Li, H. B. A Functional Single-Molecule Binding Assay Via Force Spectroscopy. Proceedings of the National Academy of Sciences of the United States of America 2007, 104, 15677-15681. Sharma, D. ; Perisic, O. ; Peng, Q. ; Cao, Y. ; Lam, C. ; Lu, H. ; Li, H. B. Single-Molecule Force Spectroscopy Reveals A Mechanically Stable Protein Fold And The Rational Tuning Of Its Mechanical Stability. Proceedings of the National Academy of Sciences of the United States of America 2007, 104, 9278-9283. Cao, Y. ; Li, H. B. Polyprotein Of Gb1 Is An Ideal Artificial Elastomeric Protein. Nature Materials 2007, 6, 109-114. Cao, Y. ; Li, H. B. Single Molecule Force Spectroscopy Reveals A Weakly Populated Microstate Of The Fniii Domains Of Tenascin. Journal of Molecular Biology 2006, 361, 372-381. Cao, Y. ; Lam, C. ; Wang, M. J. ; Li, H. B. Nonmechanical Protein Can Have Significant Mechanical Stability. Angewandte Chemie-International Edition 2006, 45, 642-645. Fernandez, J. M. ; Li, H. B. ; Brujic, J. Response To Comment On "force-Clamp Spectroscopy Monitors The Folding Trajectory Of A Single Protein". Science 2004, 306, 411C-+.